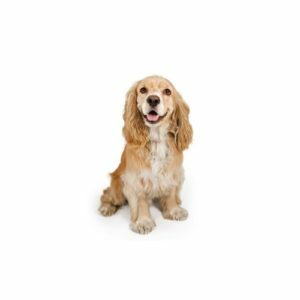 Exhibited in the US since the 1880s, the Cocker Spaniel remains one of the most popular breeds according to AKC? registration statistics. The Cocker has a sturdy, compact body and a silky, flat or wavy coat. He is a merry, well-balanced dog that is capable of considerable speed and great endurance. Cocker Spaniels can be black, black with tan points, parti-colored or any solid color other than black (ASCOB). Average size: from 13 ?_ inches to 15 ?_ inches at the shoulder.